However, the violations issued to Williams by umpire Carlos Ramos are not examples of sexism or racism. Though Ramos is a notoriously strict umpire, the International Tennis Federation has officially backed his rulings, and his actions prove that he is at worst a stickler for the rules, not that he has any inherent bias against black or female players. The umpire’s harsh calls appear to extend to players of all races and genders, as Rafael Nadal, Novak Djokovic and Andy Murray have also criticized violations imposed on them by Ramos in the past. Many have brought up the infamous courtside tantrums of John McEnroe as evidence of why Ramos’ calls were sexist, as McEnroe was not always penalized for his outbursts, but this does nothing to prove that Ramos himself is sexist. If anything, it should encourage the continuation of a discussion about sexism within the sport itself, not a singular sexist umpire. The sad reality is that Williams has a history of furious verbal attacks during matches. After losing a 2004 match to Jennifer Capriati, Williams claimed that umpire Mariana Alves had gone “temporarily insane” and implied that Alves had cheated her of a win. In a 2009 US Open match against Kim Clijsters, Williams was first penalized for racquet abuse, then for a foot fault, which prompted her to threaten to shove a tennis ball down the lineswoman’s throat. The Grand Slam Committee issued her a fine of $175,000 for the remarks. At yet another US Open match in 2011, Williams made a series of threatening remarks and rude gestures toward chair umpire Eva Asderaki, including advising the umpire to “look the other way” if she ever saw Williams coming, which earned her a $2,000 fine. Arguing with, disrespecting and threatening the umpire should never be tolerated in the game of tennis, and Ramos was right to call Williams out. Just because Williams has been discriminated against in the past does not mean that every call against her is the result of sexism or racism. It is especially disappointing that in this particular instance, the focus on Williams turned Naomi Osaka’s extraordinary win into a scandal. Osaka was visibly in tears at the end of the game, and during the trophy presentation, the crowd’s jeers interrupted the ceremony several times over. What should have been a wonderful day to look back on turned into a nightmare for Osaka, and those who booed her and chose to instead focus on Williams should be ashamed of themselves. The moral of this story is that the Left has become so rabid in their flippant use of "Muh Racism" and "Muh Sexism" that even normies are becoming immune and waking up from their Matrix delusions. 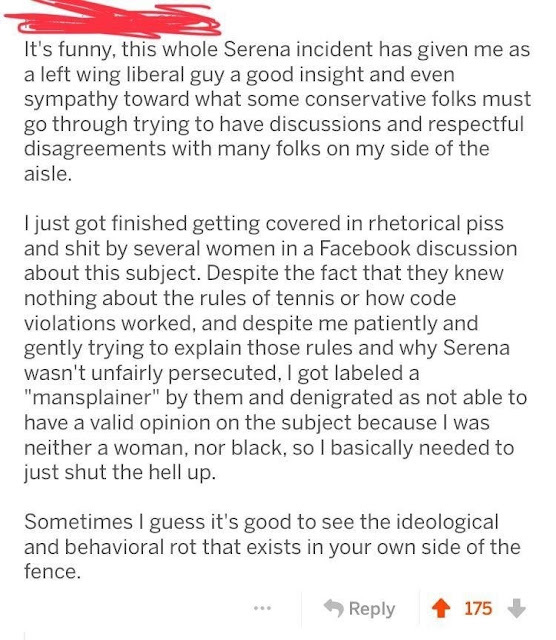 From a political view point, this is simply one more reason why President Trump will win again in 2020 because more and more normie leftists are getting a rude awakening that even when they are being reasonable on a simple subject such as TENNIS, they are deemed racists. Therefore, by the time the 2020 election comes back into swing and all the sexual-allegation politics are viewed for what they are; sexual-allegation politics they will more readily vote for Trump because he represents the last bastion of normalcy in comparison to what modern day Democrats represent--victimhood culture that ignores facts and lionizes fake victims. Fake News Strikes Again! Was the Native Man HARASSING the Innocent Catholic Boy? Did Governor Bill Walker End His Campaign Over #MeToo?